In concept, city builders are obvious: build a city. But the complexities of execution far outweigh the apparent simplicity of gameplay. In truth there’s nothing simple about creating a good city builder, because “building a city” means modeling an economy, and an environment, and dozens (or hundreds or thousands) of citizens who must at least appear to be acting intelligently. Building a city means zoning and organization, urban planning, long-term improvements, dealing with disasters, and juggling a million populist wants and needs while keeping the best interest of your metropolis in mind. It’s not often you see a really, really bad one, but just as rare to find a true jewel. The best (the venerable Caesar III comes to mind, but age has long since caught up with it) tend to be played and replayed far beyond the span of their novelty, which itself says something about what makes a great city builder. No matter how many times I’ve been through Caesar III, it’s always different. It always challenges. Each city always has something unique. Banished looks like it’s going to run with that concept. It’s fairly simple compared to a lot of city builders – not surprising considering it’s entirely the work of one person – but it’s also beautiful and peaceful in a way that many of the genre aren’t. It’s a slow paced game that doesn’t punish you for stepping away to change a load of laundry (you can pause or slow time if you like), and doesn’t overwhelm you with mechanics and information. If you go in expecting the depth and complexity of Tropico 4, you’re going to be disappointed, but those expectations would be completely unrealistic and unfair. Judge Banished for what it is: the work of one very dedicated, multi-talented person that distills a lot of what we like about city builders and leaves the other stuff for big dev teams. At times it seems like Banished leaves things like “functioning correctly” for the big dev teams too. But the jury’s still out on that. One problem with city builders – until you’re intimately familiar with how they work, it’s difficult to know whether the game’s not doing what it’s supposed to, or you’re not doing something you need to. A group of exiles from some other society have decided to strike off on their own – well, I guess technically they’ve been banished, but the game never goes into it – and you’re in charge of helping them carve a home from the wilderness. 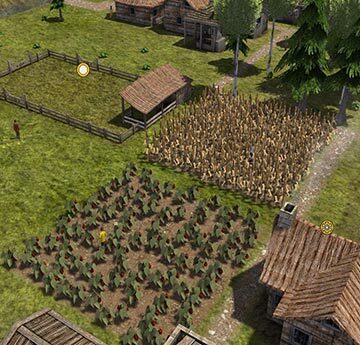 Banished is deceptively straightforward, eschewing some of the more common mechanics of the genre. It’s a pure sandbox, for one. You start with a blank canvas and you’re supposed to build a city on it and that’s it; there are no missions, no promotion, no moving on to the next assignment. You work on the same city until you tire of it, or until all your citizens die, at which point you start a new one. That alone sets it apart in some important ways. High summer in Steerpikeburg. The bell peppers are coming in nicely. Over by the wheat field, a pasture is idle, waiting for me to buy some cows. (I feel compelled to admit that despite being a city builder fan, I’ve never actually played the franchise most normal people associated with cities and the sim-ing thereof. It, too, is a sandbox – for the most part – but for some reason I’ve always thought of it as another sort of game, not a city builder of the kind I enjoy). After an amazingly brisk tutorial that covers a little more than half of the buttons you’ll be facing, you’re deposited back at the main menu with essentially nothing to click but New Game. 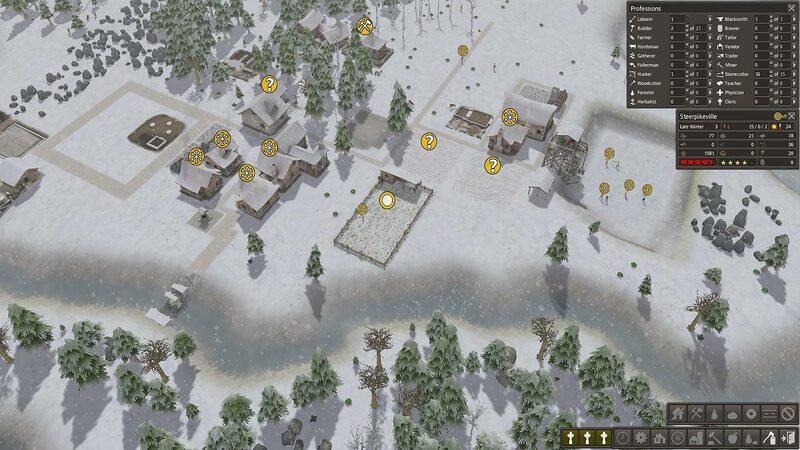 Banished explains the nuts and bolts of how to play, leaving discovery of the nuances up to you. My first game ended poorly. The procedurally-generated landscape around Steerpikeville looked pretty enough, but it was inconveniently laid out and desperately lacking in crucial early staples such as stone. With winter coming on fast and a lot of work to be done, we made the best of the situation and hurriedly plopped down some family dwellings. The cheery populace took a lot of hardship in stride, subsisting on potatoes and wild mushrooms, humoring my prematurely ambitious plan to build an immense market in the town square, and taking up picks and hoes to do whatever jobs were asked of them. And a lot of jobs were asked of them – early on you won’t have enough adults to spread the labor around, so you’ll constantly switch people from role to role. This has the dual benefit of giving you plenty to do in an otherwise slow-paced game and keeping you well-apprised of what the population is up to, but that’s cold comfort when the first snow falls and the city’s children start dying for lack of warm coats, or when you desperately need something done and no one in town bothers to do it. FOR YEARS. Anyway, I’d actually planned for warm coats. Lacking sheep and knowing it would be seasons before the trading post was ready, my hunters skinned the wild deer and brought the leather to the tailor shop. That’s where things broke down. The tailor sewed deerskin coats as fast as she could, but when the autumn harvest rolled around, I reassigned her to the pumpkin patch. Had I done a coat inventory first, I’d have known we were short, but it was fall, and who doesn’t love pumpkin pie, so I misprioritized. Since I’d also neglected to build a woodcutter’s lodge (or hire a woodcutter) to turn logs into firewood, that first bitter winter was hell on my people. Nearly all the children in town died of exposure. 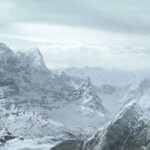 In the end, Steerpikeville lasted three years, but in the third winter we were done in by a combination of unbelievable cold and the villagers’ need to range further and further from their toasty homes to gather resources. By spring only two people remained, forlornly roaming the muddy streets. I called it. Maybe Steerpikeburg will benefit from the harsh lessons of its predecessor. 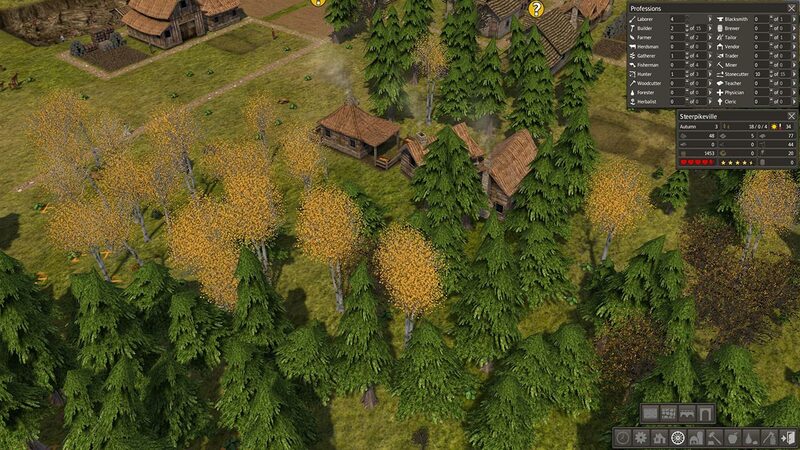 Banished gives you a lot to do despite the lack of gewgaws attached to city builders from larger dev teams. Unfortunately it doesn’t always give you the information you need to make good decisions, and the people are pathological about completing tasks in the order you assigned them unless you manually change the priority of work in a region. Once you’ve increased its priority, there’s no apparent way to lower it, nor is there a way to force villagers to do things they might not want to do, like live in communal housing until individual family homes are ready, or make like bunnies because you need more workers. All of this creates a serious backlog problem, since the list of stuff you’ve ordered isn’t visible anywhere and there’s no real way of telling what comes before or after what. Some aspects of the AI are truly delightful – people assigned to one job will pitch in to help with another, for example, if it makes sense for them to do so. When snow covered the fields, farmers took to helping laborers haul in stone and timber. Smart becomes frustrating when people don’t do their actual jobs when needed, or keep on helping others while their primary work goes idle. One spring, all six of my aforementioned farmers stayed in the forest collecting logs while the wheat fields went unplanted. The resulting food shortage killed about half the town. Another time I carefully saved up to build a trade pier, studiously following the tutorial’s instructions about placing it in the big river that cuts through each map. For five years my people waited for a merchant ship that never arrived, ready and willing to trade mountains of venison for domesticated livestock and new seed varieties. Sometimes homeless people just don’t move into homes; sometimes buildings sit half-constructed for whole seasons because nobody’s brought a load of necessary raw materials. Later, there’s no easy way to pick and choose who does what jobs, though there’s also no indication of whether one villager’s skills might be superior to another’s at any given task. I’m not yet prepared to call these “problems.” For now I’ll accept the possibility that they’re idiosyncrasies, and all city builders have them to varying degrees. Sometimes it appears that orders are being ignored or priorities rearranged because the player is doing something out of order, or skipping a key step. I suspect some of the issues will go away as I get used to the game’s subsystems, and I’ll learn to play around the others. To its credit, the odd behavior Banished has so far exhibited tends to make me raise my eyebrows rather than shriek with rage. The most irksome bug I’ve encountered so far is its clumsy Steam integration – Shift+Tab doesn’t bring up the usual Steam overlay. Alt+Tab works strangely too. But the game itself runs beautifully, and looks beautiful too, autumn’s golds passing into winter’s gray in full DirectX 11 splendor. A floating-window interface allows you to move and pin info. Most AAA games don’t bother with little things like that, but they’re appreciated. Banished has a soothing, hypnotic quality, and despite the narrow focus and occasional misbehavior gives the impression of a complicated simulation. I’ll need to put in more time before I can say for sure, but from the hours I’ve spent, it feels like the math going on under the hood is pretty solid, needing a polish rather than an overhaul. In the long term, the developer needs to take a look at some issues – like the farmers not returning to farm when winter ends, and construction sites sitting idle for years at a time despite the abundance of necessary resources mere feet away in storage piles. If fixed, I see a lot of potential for Banished. Visually and urban-planningly it shares much with Grand Ages: Rome, one of my favorite city builders of the past decade (though, sadly, no one else’s), and its focus on long-term steady growth rather than objectives leading to a new map give it a permanence you don’t see in other games of the type. 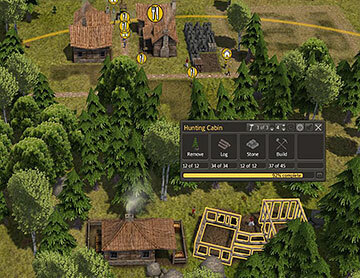 At $19.99 – and done at $19.99, issues aside, none of this Early Access Pay For A Broken Alpha nonsense – I think Banished could be a good investment for anyone looking to slow down a little, provided they can tolerate some pretty sizable functionality question marks. It is not Grand Ages: Rome, or Tropico, but it never claimed to be and it doesn’t need to be. In fact, the game Banished most reminds me of – despite the two having basically nothing in common – is Eric Chahi’s latest, From Dust. Both are experiences rather than challenge arenas. Where most games strain, those two lilt. 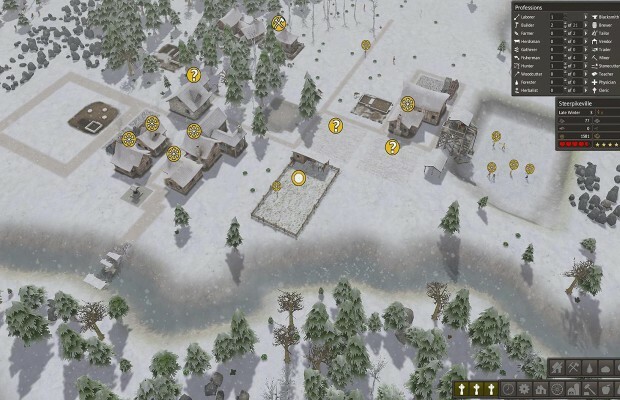 Banished is as much about watching smoke puff up from a snow-covered chimney, family warm and safe inside, as it is about laying down streets. You might prefer to wait for a sale – or a patch – but it’s reasonably priced and I see the specter of real depth here. As quickly as you’ll learn the ropes of Banished, I can’t help but sense there’s a lot more I haven’t yet encountered. I remember reading a preview of Banished a while back and thinking that it sounded like a potentially exciting city-builder… one in which total failure was a continual possibility. Sounds like its creator has delivered on that promise! I shall have to check it out. Did you see the post on Quarter to Three about Banished? Funny stuff. Curses, Sakey! I had to go get this game after reading this last week. Somehow it’s Monday already. I think I’ve played 30 hours. My first town was doomed when all the children died of starvation and all the adults were past child-bearing years. But my second town is alive and kicking with 260 residents. This is really scratching that itch which was only aggravated by that EA catastrophe. However, I’m already feeling the need for some expansions to come out with some further features. As it stands, I may have already played myself out of this game. There are some ways I’ve found around some of the bugs/features you mention above, but don’t want to offer advice where it’s not wanted. Thanks for your thoughts on this Steerpike. Yours is actually the first review I’ve read that makes me want to try the game. I think I’ll wait for a sale though. I have too much on my plate as it is now.